PRO Match Ultra is a target grade pistol with standard features that make it match ready right out of the box. They start with a massive recoil resisting steel frame and add thin G10 grip panels to drive the gun. 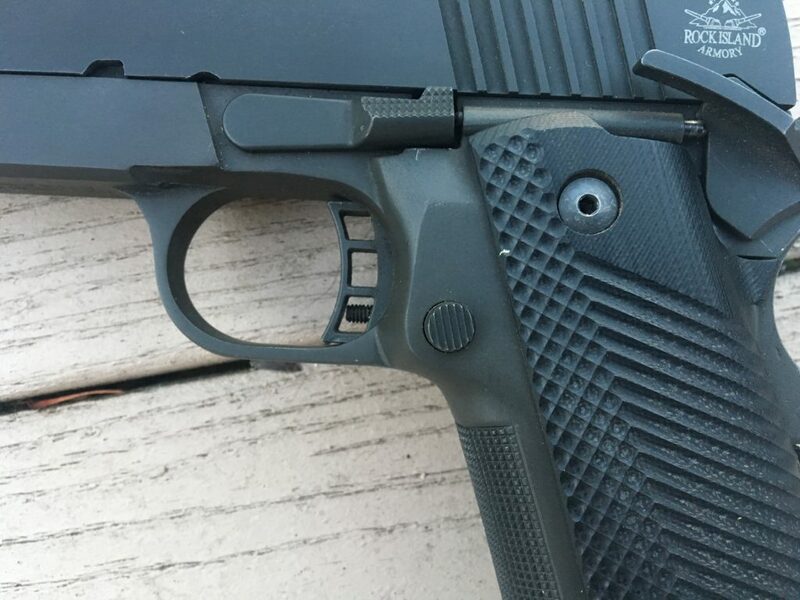 The grip width is about 1.35″, which is only 0.17″ thicker than a GLOCK 17. The Ultra 1911 PRO Match is a heavy pistol which shoots like a smaller caliber; the .40 feels like a 9mm. The weight at the muzzle, the textured grips, and the wide back strap reduces felt recoil and muzzle flip. The PRO Match Ultra is checkered on both the front strap and back strap and has a generous magazine well funnel. The mag well pushes my hand up and indexes my grip. 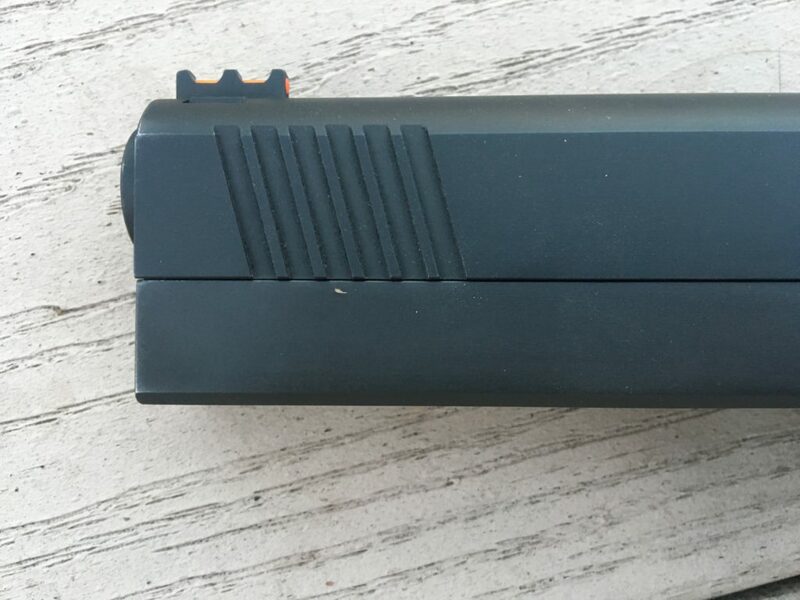 Combined with the taper at the top of the double stack mags, the mag well makes reloads fast and easy. The High Visibility Fiber Optic front sight makes target acquisition fast and the adjustable LPA rear sight (dovetailed in a low-mount slide cut) makes it accurate. 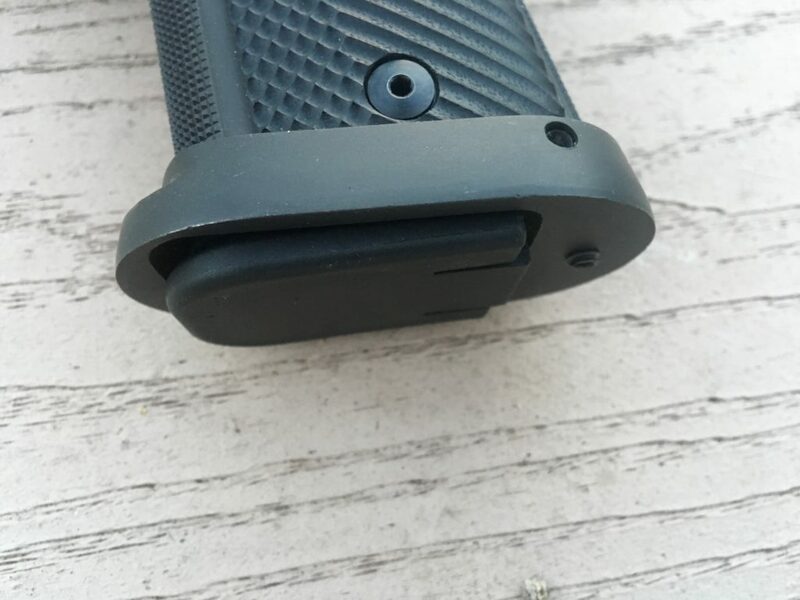 Front and rear slide serrations make manipulations easy. The curved, serrated, skeletonized trigger is adjustable for over-travel and provides a feel that rivals custom pistols. There is almost no creep with a clean break. RIA states a break weight between 4 and 6 lbs, my gun is closer to 4. 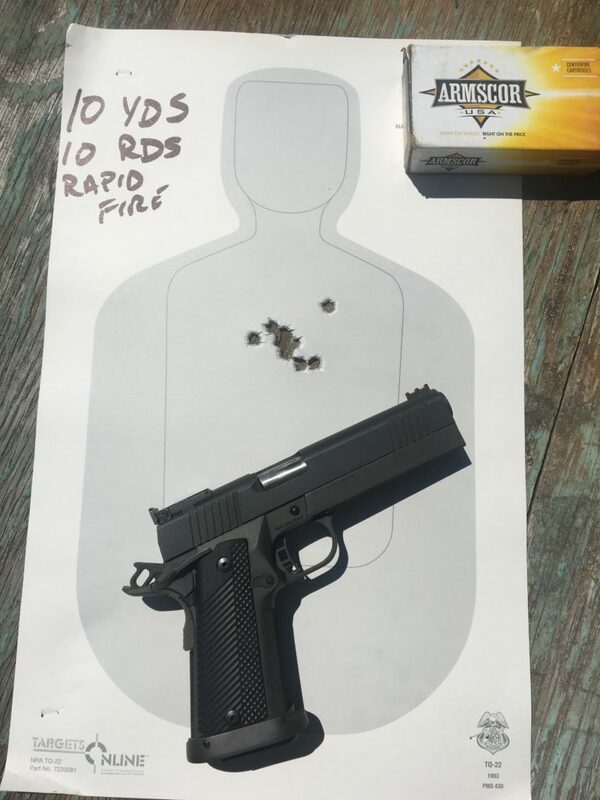 Accuracy is as good as any factory 1911 I have ever shot. I can consistently hit a 12-inch plate at 50 yards standing unsupported. The gun can shoot a tighter group than I can hold. The nice trigger and longer sight radius make all the difference. The slides and frames are black parkerized. I like this finish and the Ultra Match has a deep color and nice consistency. The fit is good where it matters for accuracy: the barrel hood, lugs, and bullnose match up nicely. The bushing-less bull barrel locks up snugly. A solid, one-piece guide rod locks up the same way each shot. The Ultra Match is a double stack but the controls, fire control parts, grip panels, sights are standard 1911. Holster fit is iffy with the extended dust cover but there are many models that work. I found a Safariland holster that fits my gun perfectly. Rock Island Armory (also known as Armscor) began in 1905 as the Squires Bingham & Co photo shop in Manila. The store transitioned into a sporting goods store selling sporting guns and ammunition. In the 1930s a local entrepreneur bought the Celso Tuason. After the Japanese invaded, firearms and ammo were confiscated but the company continued in business by selling clothing and furniture. In spite of cruel oppression and harsh reprisals, the people of the Philippines resisted by attacking Japanese forces and providing intelligence to the Allies. This produced an attitude of self-reliance and a culture of firearms and self-defense. After the war, the Tuason family began making guns as the Arms Corporation of the Philippines or Armscor. Armscor produces rifles, shotguns, semi-automatic pistols and revolvers selling guns in 60 countries around the world. The company has also made parts for the STI Spartan, Auto-Ordnance and High Standard. 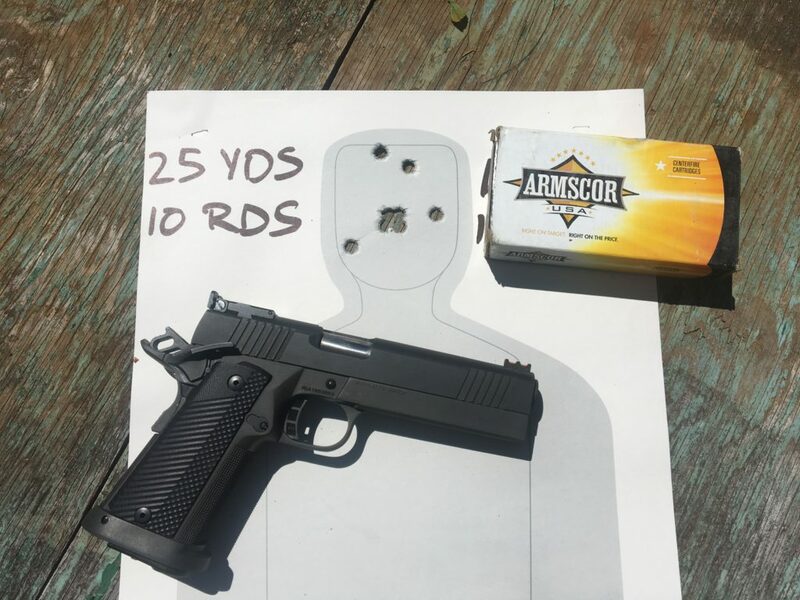 Armscor is the largest producer of M-1911 pistols in the world. The M-1911 has served all around the world with many countries in countless conflicts. The design continues in the independent culture which originally inspired it. The US Army’s 1911 was procured to stop Moro tribesmen of the Philippine islands. Much of the fighting was at close quarters and the Moros’ kris knives were deadly effective. US troops were armed with .30 caliber Krag and Springfield bolt-action rifles as well as Colt M1892 revolvers, chambered in .38 Long Colt. The .38 handguns failed to reliably stop the highly motivated attackers. Model 1873 Colt revolvers chambered in .45 caliber, relics of the Plains Indian Wars, were brought out of arsenals and returned to active service, where they again proved effective. The Thompson-LeGarde tests conducted by the US Military in 1904 were perhaps the most intense study of handgun effectiveness in history. The tests were conducted at the Union Stock Yards in Chicago, Illinois. Several different calibers were used during the tests: 7.65×21mm Parabellum (.30 Luger), 9×19mm Parabellum (Germany), .38 Long Colt, .38 ACP, blunt and hollow-point .45 Colt, .476 Eley, and the “cupped” .455 Webley. Cartridges were tested for their penetration and energy transfer, using both live and dead cattle at the target medium. Human cadaver tests were conducted by suspending the body as a ballistic pendulum. The sway when the body was shot from different distances measured the relative momentum of the rounds to some extent. The M-1911 was procured based on the results of these tests to ensure American soldiers would have the hard-hitting handgun they needed. I have had my PRO Match Ultra .40 for three years and fired over two thousand rounds through it. I have never had a malfunction or stoppage which was not directly caused by reloaded ammunition. (I should buy better ammunition). I have cleaned and lubed my gun, but I have never performed more than simple dis-assembly and wiped it down. Right out of the box, these versatile 1911 pistols are competition and hunting-ready. They’re reliable, accurate, fun to shoot and fast. With an MSRP of $1077, the PRO Match Ultra .40 offers solid value with an unmatched fun to cost ratio. Many of the 2011 alternatives cost well over twice the price with fewer features. 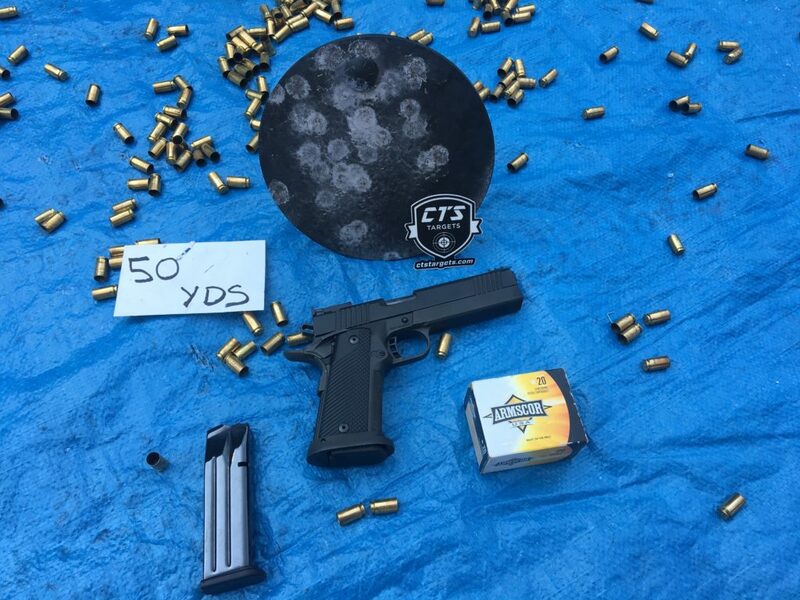 Each pistol comes with two magazines, owner’s manual, warranty card, fired cases, and sight adjustment tool. Visit Rock Island Armory for more information by clicking HERE. I can certainly vouch for the quality of RIA firearms. They produce excellent quality products.